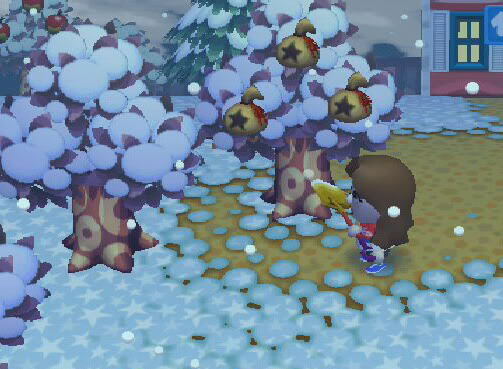 Trees can play a major, or minor, part in Animal Crossing, all depending on how you use them! Orchards look really nice in your town, and you won't have a bunch of scattered trees. You can either have them all representing one fruit (or bells), or just have them together randomly. Your choice! 1) First, make sure you have a big open area, with no houses, other trees, or empty space house signs. Note: You can go on as down and far as you like in this pattern. 4) Plant the fruit in the holes! 5) Wait for it to grow into a wonderful new orchard for your town! Ever heard the saying "Money doesn't grow on trees"? Well, in Animal Crossing, it actually does! You can plant bells in the ground to make a Money Tree! First, dig a hole with your GOLDEN shovel and place any amount of bells in the hole. Once you have buried the bells just make sure the tree WILL NOT DIE for you will lose the bells you placed in the hole. I will use 10,000 bells as an example. Once the tree grows it will be a 10,000 bell tree as long as the tree does not die, and each tree will have three of these, just like each fruit tree produces three fruits per tree. Useful Hints: Each bell deposit increases in percentage for living and growing into a Money Tree. For example, 1,000 bells planted has 1% chance of becoming a Money Tree, 10,000 bells planted has a 10% chance of becoming a Money Tree, etc. As well, try to make sure that you plant them where they can not only get water (like from a river; don't plant them too close to rivers though), but they have plenty of space (no trees too close) to grow as well.